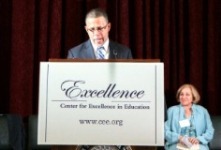 Nearly 150 alumni, business leaders, policy-makers, international education officials, and scholars turned out for the Center for Excellence in Education’s Annual Congressional Lunch in Washington, DC. at CEE’s Annual Congressional Luncheon. 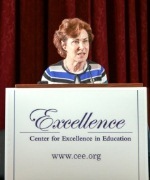 Celebrating 35 years of success through its STEM-based programs, CEE’s President Joann DiGennaro promoted the importance of the Research Science Institute, the USA Biology Olympiad, the Department of Defense Internships, and the Teacher Enrichment Program. “CEE wants our country to be leading in the global community and we all want to maximize opportunities for all of our students,” said CEE President Joann DiGennaro. 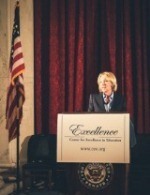 Secretary of Education Betsy DeVos praised CEE’s mission and accomplishments. “I really admire the work of this organization. You were promoting STEM before STEM was cool,” she said. 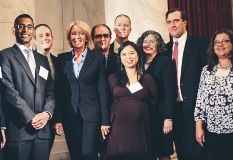 Secretary DeVos and Members of Congress from both parties were united in highlighting the importance of making STEM education a priority for all students to grow U.S. innovation and business. 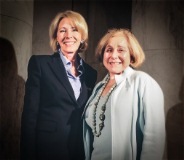 Sec’y DeVos (L) with CEE President Joann DiGennaro. Congressman Rob Wittman of Virginia predicts a huge demand for a STEM-trained workforce. “In the future, 85 percent of the jobs that will be out there will require some form of science, technology, engineering, and math. So I tell students today if you’re not at least having some understanding in those realms then you need to,” he said. CEE Alumna Dr. Molly Peeples, Aura Associate Astronomer, the Space Telescope Science Institute. Congresswoman Jacky Rosen of Nevada is a former software developer. She praised CEE for its programs making STEM education more accessible. “Across the country, we’re continuing to see a huge demand for workers in STEM fields, for software developers, mathematicians, health aids, across the board…but despite these increasing opportunities, not enough Americans have the STEM skills and STEM education. So it’s organizations like you that are rising to the challenge by providing thousands of under-served students with access to that kind of education,” she said. reaching more than 400,000 students in under-resourced communities. The USA Biology Olympiad is taking place at the University of California San Diego for the first time ever in June 2018. CEE’s USA Biology Olympiad has reached 150,000 students since 2003 and every finalist has medaled at the International Biology Olympiad. USABO 2017 Finalist Wenbo Wu. Keynote speaker, Dr. James Bird, Professor at Boston University’s College of Engineering, presented “The Science of Bubbles.” His address discussed many of the applications of drops and bubbles for disease control, defense, mining, food production, energy, and medicine. “There’s some really new, promising research suggesting that these same ideas can be used to bring drugs across the blood-brain barrier. Using acoustics and bubbles to kind of create this transfer otherwise quite difficult to do,” he said. The Center for Excellence in Education is a nonprofit dedicated to nurturing leadership and excellence in STEM education through national and international programs for students and teachers. Dr. Jack Cook (from left) with Dr. Bird and CEE Trustee Robert Curry.